I had an interaction the other day on Facebook that left me feeling disturbed, a bit angry, disappointed, upset, and frustrated. I often try not to get into the political arena on social media because it’s all so polarized and it’s almost impossible to have any sort of reasoned discourse; there’s always someone who will take offense, misread or misunderstand what you said, or who’s triggered into some impassioned response whether positive or negative. But, I’m human and I react just like everybody else. And a combination of things—NPR and various other news reports on the 50K+ of children stranded at the border and several posts from other friends in reaction—served to compel me to react as well and share someone else’s post about it. I made a statement when I shared, but given the result, I realize that although my intention might have been good (expressing compassion), by sharing someone else’s interpretation of an event rather than simply voicing my own words around the situation, I wasn’t practicing Right Speech—and there were consequences. "Abhaya Sutta: To Prince Abhaya" (On Right Speech) (MN 58), translated from the Pali by Thanissaro Bhikkhu. Access to Insight (Legacy Edition), 30 November 2013. Communication has evolved in ways that the Buddha could never have foreseen. Social media, blogging, texting, emailing, and phoning are all ways we talk to, with, and at each other beyond face-to-face conversation. 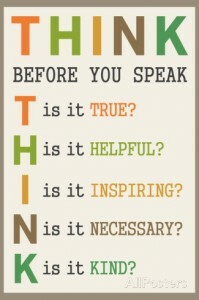 And my latest social media communication frustration got me thinking about how we communicate in general and online. I do think that many of us are pretty sure that we are communicating well when we do, whether we’re sharing our latest status update, the funny video with a cute baby and a dog, the picture of our gourmet dinner, our take on a particular way of eating that we’re sure will cure all your ills, our joy or sorrow over personal milestones, promoting our business products and services, commenting on books or movies, sharing an incendiary image and article because it supports our personal viewpoint, or sharing the latest inane meme. In my opinion however, I don’t think we are communicating well at all. 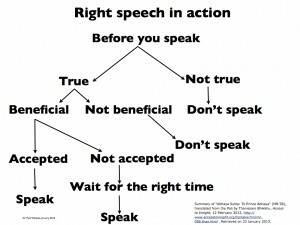 I think most of us—myself included—could do with a refresher on the Buddhist concept of Right Speech. 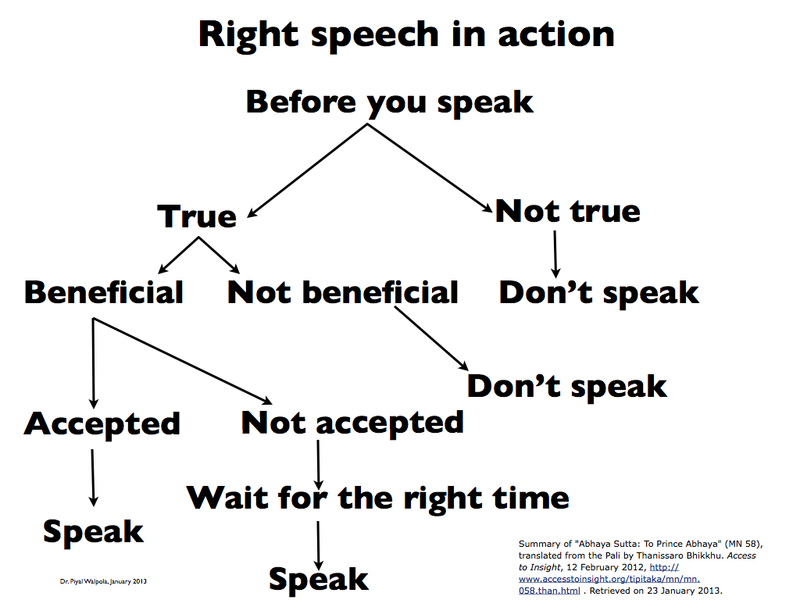 Right Speech (samma vaca in Pali) is part of the moral discipline portion of the Buddhist Eightfold Path along with Right Action and Right Livelihood. Practicing Right Speech at a time when vitriolic prose runs rampant through social media, radio talk shows, and late night comedy can be a pretty tough path to follow. It’s SO EASY to get caught up in our passions around perceived and actual wrong doings, opposing political views, and the over-arching negativity that seems to rule the media; if it’s negative, horrific, and distressing, it clearly must be news. And we must remember that a good part of Right Speech is listening well. And these days, we’re being talked AT more than ever … and we’re doing it, too. Hateful and violent words can harm just as easily as hateful and violent action. There are children killing themselves because of cyber bullying … they’re not necessarily getting beat up physically, but mentally and emotionally, they’re bruised and bloodied. There are children who suffer with profound hunger, physical abuse, homelessness, and addictions that aren’t killing themselves. Emotional and mental pain seems to be the harder to endure. It’s always been the case that words, written or spoken, can bring peace or war, union or division, anger or joy, compassion or hatred, love or indifference. What you say matters. The idea is that by practicing Right Speech you can avoid the pitfalls of Wrong Speech which are conflict, division, confusion and suffering … all plentiful in the world. At face value, it doesn’t seem like it’d be that hard to practice, right? But really, if we truly look at what the Buddha meant behind each of the characteristics of Right Speech, we see how challenging it might be in today’s world. 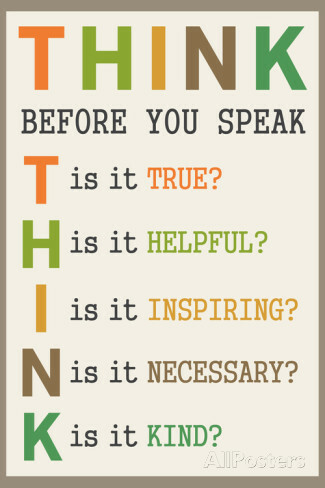 For example, someone may post a negative comment about some entertainer’s performance/album/movie. Can you refrain from commenting? We often find sarcasm funny and witty, and it sometimes is, but it can also be hurtful and mean when directed at an individual’s opinion or personal expression (whether choice in clothing, hair style, makeup, etc.) Can you refrain from sarcastic remarks about people? Chit chat, aka meaningless chatter, is a staple of social interaction. Can you avoid saying, “How are you?” unless you really want the answer? When someone poses an opinion with which you disagree, and you feel you must respond, can you do it with kind and compassionate language rather than rude, dismissive, or argumentative language? For myself, at this moment, I’m holding the frustrating Facebook exchange in gratitude because it helped me remember that *I* am responsible for what I say, think, and do. How I react, how I interact—verbally or via the written word—is important. It’s truly not about being a Pollyanna and pretending that there aren’t problems in the world, but rather I think we must be compelled to look deeper and figure out how to help, not hinder; figure out how to find some compassion for those embroiled in the many disastrous situations we hear about–whether we find said situations morally wrong or not. And finally, we must find some allowance for others to have different opinions and consider that they’re not necessarily wrong and we’re not necessarily right; the answer is usually somewhere in the middle. And honestly, at the end of the day, Mom had it right. If you can’t say anything nice, it’s much better not to say anything at all. What do you think? Can you pick one characteristic of Right Speech and practice it for a day or a week? I’d love to hear your experiences with it.